Adrian Lees has been working on Aemulor and Aemulor Pro 2.32 to fix various bugs and improve support for multimedia software and, in particular, educational CDs from Shertson and Anglia. A preview of Aemulor for the A9 range of computers should be on display, provided the team can find a spare A9home for the event. They'll also be exhibiting a preview of the Aemulor compilation engine. Neil Spellings said this, "compiles the entire application into 32bit before execution. Initial performance increases look promising." Geminus can also now use the Iyonix's NVidia graphics card to cache sprites to speed up OS sprite plotting. This includes filer window redraws and other desktop sprite based graphics. The display driver also enables hardware acceleration for drawing horizontal and vertical lines, which boosts drawfile rendering. Drawing the old school system font to the screen, as seen in !Edit, is also now hardware accelerated, and screen redraws are also cached. Neil explained: "Areas of the screen which have been invalidated by moving window furniture over them can be cached on the NVidia card, and re-plotted directly from the card's memory which is much faster than asking the application to re-draw its screen contents over the PCI bus. This is most noticeable on applications such as ArtWorks, where screen redraws of complex drawings can take a while." Recently open sourced graphics packages, OpenVector, DrawPlus and OpenGridPro have also been bugfixed, as well as stablemate DeskDebug; a list of updates is here. R-Comp's MusicMan software has been tweaked to allow customised CD track listings to be saved to disc, and a new mini-toolbar to control playback has been added. UniPrint 2 is touted as a "major" upgrade to the network printing software: It can now handle text mode printing, and can launch files stored on your RISC OS machine on a networked Windows computer. For instance, double-clicking on a PowerPoint file on RISC OS will cause the presentation file to be opened on your Windows PC. The same can be done for website URLs, allowing a RISC OS computer to instruct a Windows PC web browser to open the webpage. Printing multiple copies of documents has been improved in terms of resources used, and a RISC OS computer using UniPrint can be notified when a job is done. The software auto-detects VirtualRiscPC, supports queued printer jobs, and has improved support for networked printers. R-Comp have urged people to upgrade to UniPrint 2, as support for version 1 will cease at the end of 2005. Work still continues on DataPower 3 and DialUp/NetFetch, we're informed. As reported earlier, ArtWorks 2.5 will feature PDF export and will be released at the Guildford show. Programmer Martin Wuerthner said: "Direct PDF export allows print-ready high-quality PDF files to be exported from ArtWorks with full support for advanced vector-based transparency effects, CMYK colours and high-quality sprites with masks, all of which are firsts for PDF files created from RISC OS applications." An upgrade from 2.4 to 2.5 will set punters back 30 quid. 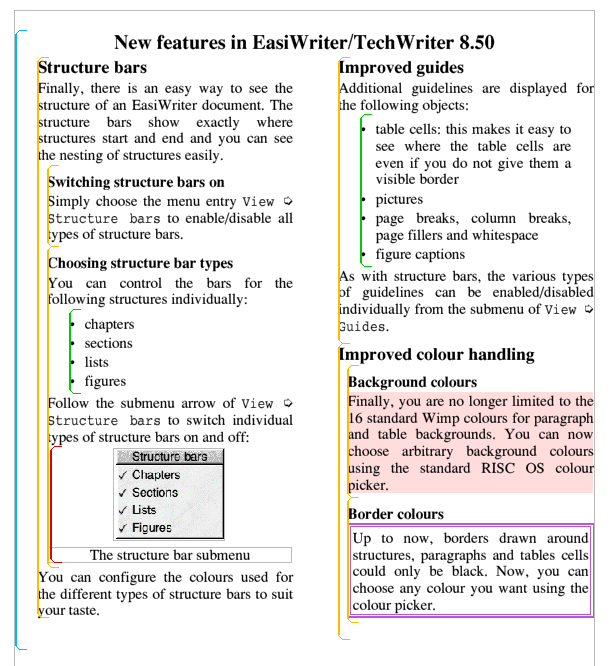 Martin has also been spending time on version 8.50 of EasiWriter and TechWriter. This version will be on display although not necessarily on sale during the show, and will include: 'Structure bars' that colour-code paragraphs and sections of text, improved colouring support for backgrounds and borders, and improved guidelines around table cells, pictures and other elements. Martin explained to users: "There is something else you will be able to do with a single keystroke in 8.50 and that is moving structures up and down. For instance, when you are editing a list, pressing Ctrl-Shift-U moves the current item up and pressing Ctrl-Shift-D moves it down. You can select several entries to move them in one go." Dealer and publisher APDL will be running a special offer on overclocked StrongARM processors, for those who wish to trade in old 200MHz parts or still haven't upgraded to the StrongARM yet in their computers. They'll also be selling a new Fourth Dimension games compilation CD, that is being compiled this very moment, and the RISC World compilation DVD. Qercus magazine won't be bringing many back issues of Acorn Publisher, so let them know in advance if you want to reserve a particular copy. Mathmagical Software, run by drobe.co.uk writer Martin Hansen, is launching a new title this weekend, alongside TurtleChalk and ArtGraph. Robin Edwards has tweaked his Seriously Statistical Software to make it fully 32bit safe. A new version of Firefox for RISC OS is being prepared for Thursday, to be sold on CDs at the show by drobe.co.uk's Ian Chamberlain. Other exhibitors include Castle, CJE Micros, Archive, EFF and RISCOS Ltd. Incidentally, ROL boss Paul Middleton appears to be selling an old, large Acorn sign on ebay. The line up of show presentations appears to be: Jack Lillingston of Castle, Paul Middleton of ROL, Chris Evans with sidekick Stuart Tyrrell talking about the A9home, and finally, John Cartmell from Qercus. Event organiser John Sawer was fairly shy about the show, although he's looking forward to seeing the A9home on CJE's stand, and the updated software from MW Software, David Buck and R-Comp. More information on the show theatre: The first presentation starts at around 11am, and last about an hour each. There may be a short talk from 3pm to 3.30pm. Organiser John Sawer said: "Defering the first presentation until an hour after the show opens is to enable the initial rush to die down (and allow people to spend money) before the first presentation starts." Volunteer to help at the show Going to the show? Odd that there is no theatre program on the website. Unix Porting Project, Netsurf and Drobe will be sharing a stand. Come over and chat to me. As usual, they'll be free sweeties! The ARM Club will be there, offering our usual range of products including DiscKnight, taking membership renewals, offering technical assistance, and generally available for a chat. I'm afraid I'll only be there in the morning, so stop by early if you want to see me. Mark "GameOn/StrongGuard" Smith and Tom "networking" Hughes will there all day, and if you have any suggestions for Eureka magazine, our Editor Andrew will be around too. fylfot: 'they'll be free sweeties!' Mmm - who did you have in mind?! Thanks Druck I would of forgoten to renew my ARM club membership. Will the A9 home be for sale at the show? Sigh. There go people making light jokes of the fact that someone wrote "they'll" instead of "there'll" and you go and write "would of" instead of "would have". Dave - feeling a bit pedantic after a day writing technical specs for a bunch of ungrateful *&**$%�! Oops, just accidentally found out how to put in the 'in reply to' bit. Sorry, there shouldn't be an 'In reply to' in there, it should just say Dave. I'm looking forward to seeing some after show news reports and photos. DS1/Drobe Webmaster: How do you put the 'in reply to' bit in? I've searched the page for a comment help link and the site FAQs! n.b. Using Fresco, JS off. If you start a line off with "name:", it gets turned into "In reply to name:"